W2 2-8-0 no. 944, posing with her crew in 1928, was a twin sister of no. 917. Both were delivered in 1903, but 944 was a Cooke product while 917 was built by Baldwin. One of the Roanoke scrapyard survivors, M2 no. 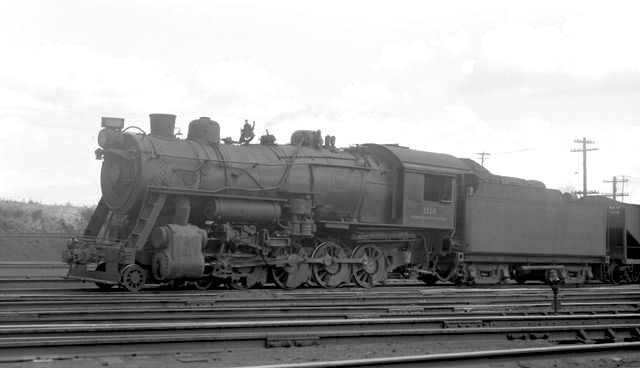 1118 is shown here in service on the N&W, photographed on August 6, 1932. Another view of 1118 in service four years later on August 4, 1936. Notice the original tender has been swapped for a 10,000-gallon USRA-pattern tender. Scrapped sister M2 no. 1147 is shown here in 1945, paired with a 12-wheel tender. Some of the M2's received even larger tenders in their later years. Tractive Effort 40,163 lbs 52,457 lbs. Boiler Pressure 200 psi. 200 psi. The Norfolk & Western Railroad is perhaps most famous for its mighty articulateds, the A and Y6 classes. However, in the early years of the 20th century, the majority of N&W's freight trains were pulled by humble 2-8-0 and 4-8-0 types. 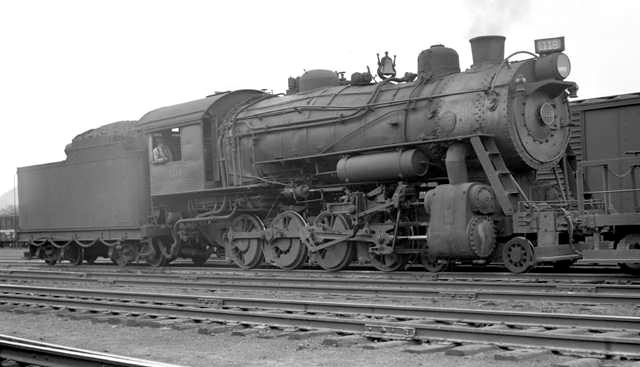 The engines from the Roanoke scrapyard are the last surviving examples of three classes of freight engines built for the N&W between 1901 and 1911; the W2 class 2-8-0, and the M2 and M2a class 4-8-0's. The grand old lady of the scrapyard engines is no. 917, a W2 class 2-8-0 built by the Baldwin Locomotive Works of Philadelphia in 1903. She was delivered to the Norfolk & Western on March 10 of that year. The first engines of this class were built in 1901 in Roanoke, and others came from Alco-Cooke and Alco-Richmond as well as from Baldwin. The last ones were built in 1905. Only no. 917 survives today. She arrived at the Virginia Scrap Iron & Metal Company yard on June 16, 1950, and remained there awaiting her fate until July 8, 2008, when she was removed from the yard for restoration and display as part of a railroad-themed diner in Bellville, Ohio. For most railroads, the next logical step up from the 2-8-0 was the 2-8-2 'Mikado' type, but not for the Norfolk & Western. Instead, they went with the 4-8-0, also known as the 'twelve-wheeler' or 'mastodon' type, starting with the M class in 1906. Although they weren't the only railroad to use 4-8-0's, the Norfolk & Western did have more engines of this type than any other railroad. The M2 class engines were essentially a large-boilered version of the earlier M class, and were the heaviest 4-8-0's ever built. The first fifty engines (nos. 1100-1149) were built by Baldwin in 1910. Engine no. 1118 was delivered to the Norfolk & Western on September 29 of that year, and fellow survivor no. 1134 arrived in October. In 1911, another eleven engines (nos. 1150-1160) were built to the same design by the N&W's own Roanoke Shops, sporting a number of improvements such as Baker valve gear and mechanical stokers. The first of these were designated class M2a. This included no. 1151, which was delivered on June 6, 1911. Later engines of the Roanoke batch included other refinements and were designated class M2b and M2c. 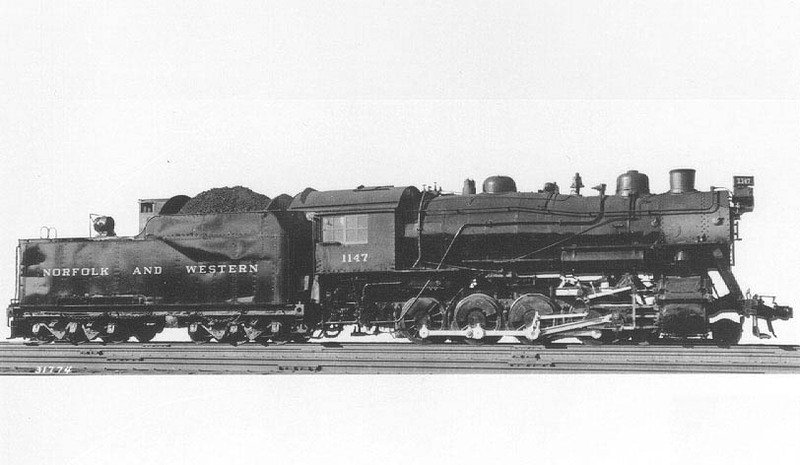 Most notably, the M2c class featured Type A superheaters, making them the first superheated 4-8-0's on the N&W. The M2a's and M2b's were then upgraded to match the M2c's, and thus all eleven Roanoke-built M2's were eventually designated class M2c. Originally, the M2's were intended as heavy freight engines, but were soon displaced by larger engines and relegated to local freight and switching duties. By 1950 they were among the oldest engines on the N&W roster. With the delivery of modern 0-8-0 switchers in the late 1940's and early 50's, many of the elderly M2's and M2c's became surplus to requirements. All of them were sold for scrap, the last ones going in 1957. The modern 0-8-0's that had replaced them would join them only a few short years later, victims of dieselization. Ironically, the M2's that survived in the Roanoke scrapyard had been among the first ones sold. M2 no. 1134 and M2c no. 1151 both arrived there on June 12, 1950, joined by no. 1118 a week later. Although two of the smaller M class engines survive in preservation (no. 433 as a park engine in Abingdon, VA, and no. 475, also a VSI&M scrapyard survivor, in steam on the Strasburg Railroad), none of the M2's or M2c's were preserved until August of 2009, when the three 4-8-0's were finally removed from the scrapyard. Engine no. 1151 departed for the Virginia Museum of Transportation on August 21, followed by no. 1134 for eventual display at the Railroad Museum of Virginia in Portsmouth, VA on August 24, and no. 1118 for the Roanoke Chapter, NRHS on August 25.